SMG hydraulic cone crusher, HPC efficient hydraulic cone crusher, sand making machine, circular vibrating screen, belt conveyors and other auxiliary equipment. The characteristics introduced: the customer's own primary crushing equipment, according to the material size and production requirements of customers, we configured for the customer three cone crusher, CS cone crusher, HPC hydraulic cone crusher two used to achieve the river the cobble large batch processing. Correspondingly, three 5X sand making machine as the ultimate mechanism of sand crushing shaping device. Whole production line to produce smooth, high processing efficiency, when produced more than 1000 tons of aggregate, provide a great help with the supply of sand and gravel aggregate for the local hydropower construction and other infrastructure construction, government departments have been designated as local typicality innovative production case. HPC Efficient hydraulic cone crusher is mainly used in metal mining, construction sand and gravel processing Sec broken and three sections broken links, its crushing capacity and yield, HPC cone crusher sand production line is used more in the river gravel and other hard materials broken aspects. HPC hydraulic cone crusher iron size the finished processed gravel grain shape 8mm following content is high, with significant comparative advantages in practical use, the stable operation of the entire production line, grain shape, and in full compliance with high quality construction mechanism gravel production requirements, customers enjoy a high praise. HPC Efficient hydraulic cone crusher is widely used in metallurgical industry, building materials industry, road building industry, chemical industry and silicate industry, suitable for crushing of medium or above hardness of a variety of ores and rock. Hydraulic cone crusher with a hydraulic cavity clearing system, reduce downtime, and each specification crusher cavity type according to different needs, users can select a different type of chamber, better crushing operations. 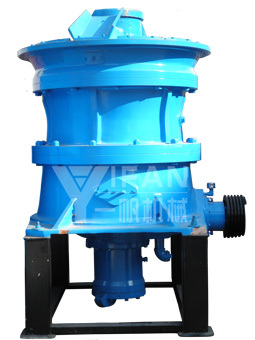 The machine is pided into standard type and short head type, in general, the standard feed size, nesting size coarse, steep short head cone crusher, feed particle size is small, is conducive to the production of fine grade materials, so the standard is generally used for rough, broken, short head type for crushing. The user can choose according to their own needs to the cone crusher. The ore from the mine mouth through the allocation extent falls, the distribution plate is mounted on the vertical axis side, due to the rotation of the vertical axis, obtained by the vibration, the ore is evenly distributed around the funnel. By with hinge lever handle and hinge not moving cone rising or falling, to regulate the discharge mouth width. Various components are cast steel manufacturing, moving cone and fixed cone face set with manganese steel liner to protect the cone from wear and tear, liner wear can be replaced, replacement, inserted between the liner and the cone melting of lead close adhesion between them.